Wine Director, Bacar Restaurant, San Francisco. 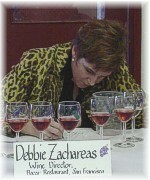 Debbie Zachareas is a familiar name for San Francisco Chronicle readers and is active on the professional wine-judge circuit. The wine director of Bacar Restaurant in San Francisco, Debbie Zachareas is a regular wine critic on the wine tasting panel at The San Francisco Chronicle Food and Wine Page.